This 1 Gbps SFP Transceiver is designed to provide reliable, high-performance, and cost-effective fiber optics in Dell products. 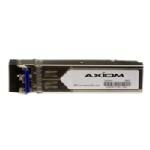 Optimized and tested 100% compatible with the Dell # 320-2879 transceiver, this transceiver is rigorously qualified to function identically in all Dell product lines. Complying with the Multi-Source Agreement (MSA) ensures scalable flexibility, and enables this transceiver to function with other manufacturer's MSA-compliant products within the same network.